Police have urged shoppers to be "vigilant at all times" after threats forced 14 Tesco stores to shut. Police closed the shops across the UK on Saturday afternoon but they reopened for normal trading on Sunday. Hertfordshire Police, which is leading the investigation, said each store had been searched and given the all-clear. "There is still no reason to believe that the incidents are linked to extremism of any kind," the constabulary added. One line of inquiry is of a possible financial motive behind the threats. The supermarket giant is understood to have lost millions of pounds in sales as the 14 stores were forced to shut. Hertfordshire Police said the stores were closed on Saturday as a precaution and no-one had been hurt. Tesco is continuing to work closely with police, it added. One store in Barnes, south west London, reopened on Saturday evening. Tesco stores were closed in Port Talbot, south Wales, Pontefract, West Yorkshire, and Market Harborough and Ashby de la Zouch, Leicestershire. Other branches shut down were in Bury St Edmunds, Suffolk; Hucknall, Notts; Hereford and Ledbury, both in Herefordshire; and Barnes, south west London. And some Scottish branches of the supermarket were also closed in East Renfrewshire and Fife. Other stores were closed in regions covered by the Lancashire and Humberside police forces. Darren, an employee from the Ashby de la Zouch store, said staff were told to evacuate the shop. "We were allowed to go back in to get our belongings," he said. "We had to be as quick as we possibly could. "We were informed briefly that the store was going to be closed for the rest of the day and we could go home straight away." 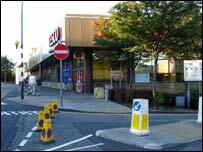 Martin Jacklin was shopping in a Tesco store in Hucknall, Notts, when shoppers were told to take to vacate the premises. He said: "Me, the wife and the children were in there, basically just doing a normal shop and it came over the tannoy that we were asked to leave, basically, go to the cashier, pay for your groceries and then leave. A spokeswoman from Hertfordshire Police said the force was leading the nationwide "criminal investigation" because the retailer has its headquarters in the county.